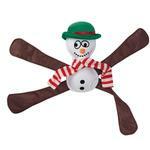 Have a fun time with this snowman that won't melt in your hands. This interactive Holiday Pentapuls Dog Toy - Holiday Snowman has 4 layers of nylon which make this a durable, superb toy for shaking, tugging, and general rough housing. This dog toy will keep your dog distracted for hours. Pentapulls are classic must have dog toys that make a perfect gift for your best friend. Made with Eco-friendly recycled materials. Posted On 11/14/15 by kim n from Edgewood , KY Yes, kim n recommends this product! My dogs love playing tug a war! This is the perfect gift for them. Very durable and loads of fun.